Lord and Taylor, located along New York City’s Ladies’ Mile of department stores, between Eighth and Twenty-third Streets and between Broadway and Sixth Avenue, reigned for a generation before it was replaced farther uptown. Stores like New York's Lord and Taylor catered to the wealthier patronage of the New York "carriage trade." 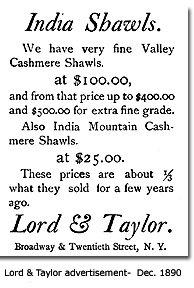 Lord and Taylor began in New York in 1826 as a small dry goods store. Samuel Lord and his cousin George Washington Taylor, immigrants to New York, located their first Lord and Taylor store near the North River waterfront in New York’s Greenwich Village. Lord and Taylor began in New York in 1826 as a small dry goods store. Samuel Lord and his cousin George Washington Taylor, immigrants to New York, located their first Lord and Taylor store near the North River waterfront in New York’s Greenwich Village. 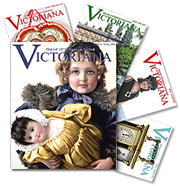 After many years, they succeeded in establishing their Lord and Taylor store as one of the most respected fashion establishments along New York’s opulent Ladies’ Mile. In 1872, Lord and Taylor moved to a grandiose cast-iron building capped by a tall mansard roof. New York's Lord and Taylor became a destination for not only shopping, but a place that women went for entertainment. In 1914, the Lord and Taylor store moved to 38th Street and Fifth Avenue in New York City. For many decades, New York City department stores such as Lord and Taylor, promoted everything from Thanksgiving Day parades and patriotic lectures to Art exhibits. 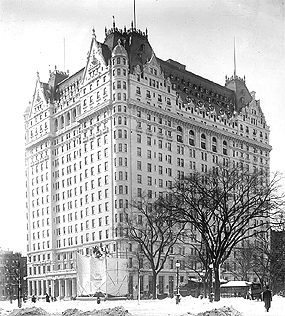 The Plaza Hotel, one of the most famous New York City hotels, opened its doors on October 1, 1907. This 19 story landmark was built in 1905-07 according to the designs of Henry Hardenburgh, architect of Manhattan's Dakota Apartments. No expense was spared in the construction of The Plaza Hotel and as a result the Plaza Hotel was considered the crown jewel of New York City hotels on Fifth Avenue. The Plaza Hotel had the privileged location on New York City’s Central Park South. From its debut, the Plaza Hotel has reigned as the most famous, the most opulent, and the most celebrated of New York City hotels. The Plaza's public rooms are lavish representations of Edwardian architecture. The Plaza Hotel has marble lobbies, solid mahogany doors, over 1500 crystal chandeliers and gold edged china. The Oak Room, the hotel's oldest intact interior, remains virtually unchanged from its opening day in 1907. The restaurant boasts 20-foot ceilings with imposing paneling of sable-dyed English oak with regal frescos of whimsical Rhine castles. The adjoining Oak Bar is decorated with large murals by American painter Everett Shinn. The Plaza Hotel's ultimate luxury and indulgent service lured the most aristocratic socialites and notorious clientele of the 20th Century to its palatial ornate ballrooms, lavish suites, and sumptuous restaurants. The Plaza Hotel has appeared in F. Scott Fitzgerald's The Great Gatsby and in the much loved children's book series of Eloise by Kay Thompson. Truman Capote held his infamous masked black-and-white ball in the Plaza's ballroom in 1966. In August 2004, the Plaza Hotel was purchased for $675 million by Elad Properties, a Manhattan-based development company. Sadly, the new owners plan to close the Plaza on April 30, 2005. The historic 805 room Plaza Hotel will be remodeled and renovated to accommodate 200 opulent condominium residences, plus 150 hotel rooms.